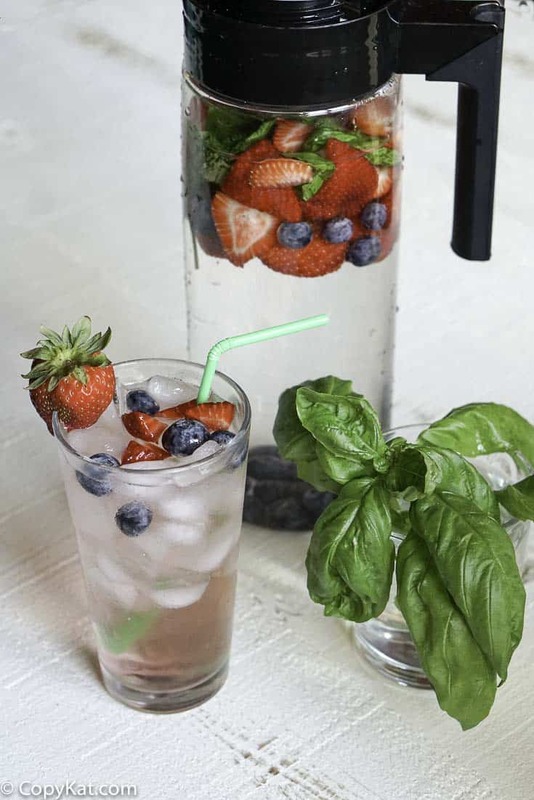 Strawberry, Blueberry, and Basil Infused Water are perfect for a hot summer day. If you have never tried making infused water before, you are missing out on a flavorful way to enjoy the water. Are you ever looking for a drink that isn’t soda and is sugar-free? I like to prepare infused water when I have guests over. I live in the hot south, so something cool and refreshing is what I love to serve my guests. Sure I put out plenty of sweet tea, soda, and coffee. I rarely put out plain water. It takes minimal effort to make an infused water, and often your guests have completely blown away and thought you spent a lot of time on making the infused water. You can make infused water with just about any type of fruit. I often use citrus fruits like oranges, lemons, or even limes. The key here is to wash your fruit well, and you want to make sure to use fruits that are blemish free. You don’t want to use fruits with any bad spots on it. You can add in an herb or two if you like. Herbs like mint or even basil add a nice touch. Cucumber also can add a nice touch to a beverage. One thing is essential when making infused water, is not to leave the fruit and herbs soak in the water forever. Ideally, you need to remove the flavoring agents in about 6 to 8 hours if you are going to store the refrigerator for a long time. I like to infuse my water in pitchers that have lids on them. This water infuser pitcher. Citrus fruits become bitter after infusing for too long. The oils leach into the water, and as the water continues to penetrate the pith, the bitter flavors come out You can always add some freshly cut fruit when you are ready to serve the water if desired. Sometimes I prepare the infused water a couple of hours before I have guests, in those instances, I simply leave the fruit in the water. This recipe was influenced by a podcast I love to listen to. 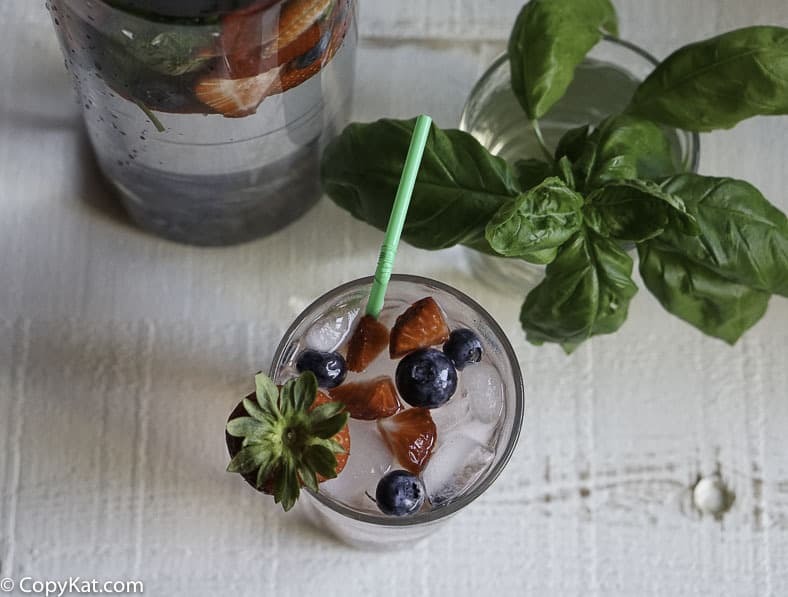 The minimalists spoke about a flavorful strawberry and basil infused water. Where I live, the blueberries are in season and I added a few blueberries to my mix. I placed all of my ingredients into the pitcher and allowed everything to infuse together for about 4 hours, I then discarded that fruit. Before serving I added some freshly cut strawberries, and I added back a few blueberries. If you happen to have a Soda Stream Machine you may want to carbonate your infused water for a fun treat. If you love saying no to soda and want other drink alternatives to soda be sure to check out the following recipes. It's so easy to make infused water. Wash the strawberries, blueberries, and fresh basil. Hull the strawberries, and quarter them. In a 2 quart pitcher add strawberries and basil leaves. Gently scrunch the basil leaves in your hands before placing them into the pitcher. This way you will release some of the oils from the leaves. Add enough water to fill the pitcher. Allow the fruit to infuse for at least two hours before serving. If serving later be sure to remove the fruit after about 6 hours. I make my “summer water” by infusing mint leaves and sliced lemons. It is a big hit at cookouts and bar be cues. I am anxious to try strawberries, blueberries and basil. I have never made infused water before. I didn’t see any directive on what to do with the blueberries. Should they be cut in half and added? This was soooo good and easy! Have you tried this using frozen fruit? I’m a ‘water baby’ and want to have this in my fridge year round. Sounds good and refreshing. I like to try this one. Thank you for sharing, I will add to recipe file.